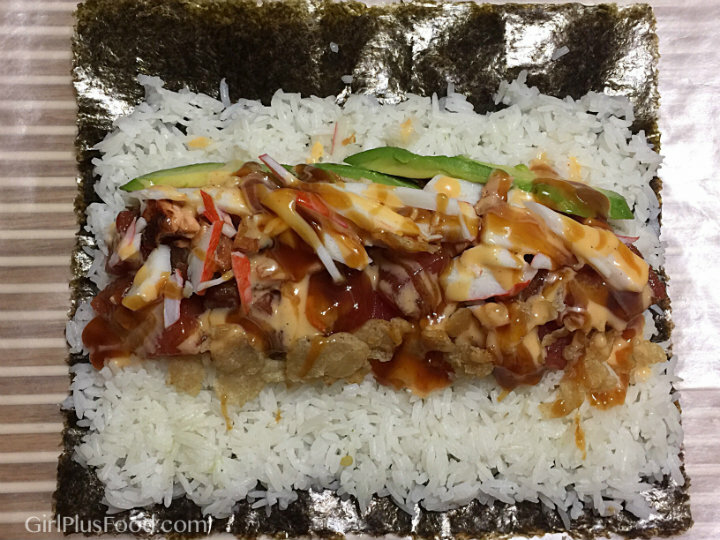 J and I were browsing through Yelp for new local places to check out, and found several “sushi burrito” restaurants. “What’s a sushi burrito?”, you ask? 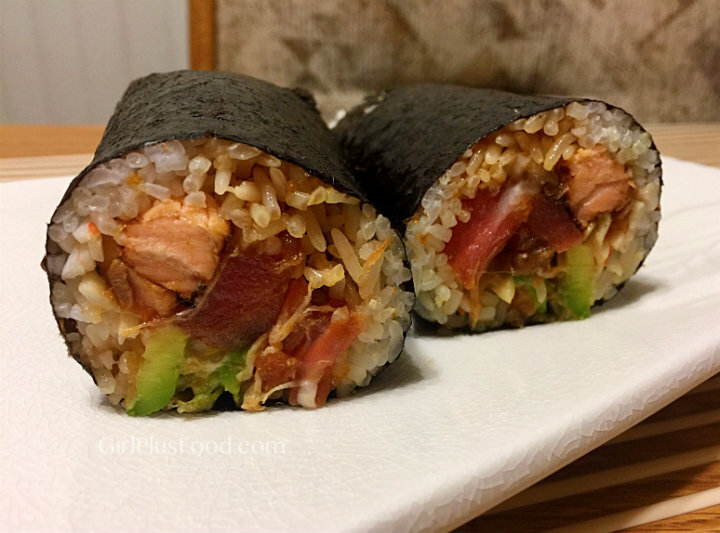 It’s similar to the burrito we all know and love… but… this burrito is filled with rice, raw fish, some greens, and pretty much anything else you want in there… all rolled up in a sheet of nori. Combine rice vinegar, sugar and salt in a small bowl and heat in microwave on high for 30 to 45 seconds. Transfer rice into large mixing bowl and add vinegar mixture. 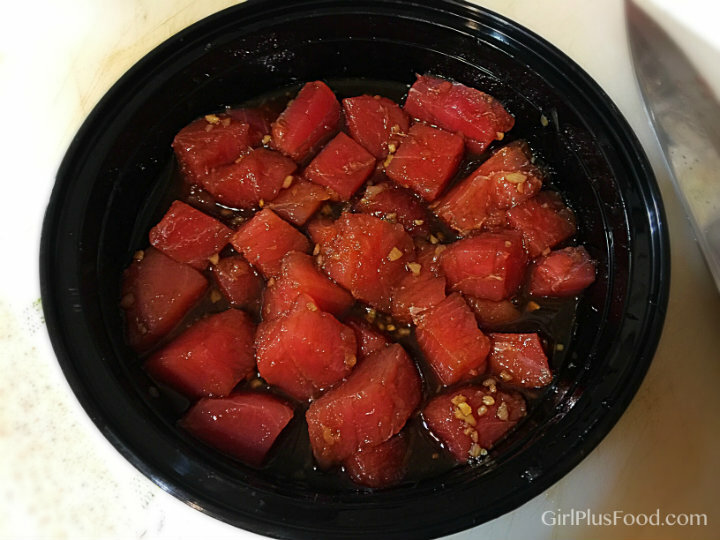 Add soy sauce, rice wine vinegar, sesame oil, sesame seeds (and sriracha if making spicy tuna) into bowl with Ahi and mix well. Place the salmon on a parchment-lined baking sheet or oven-proof dish and toss with olive oil. Bake for 10 minutes, or until just firm. 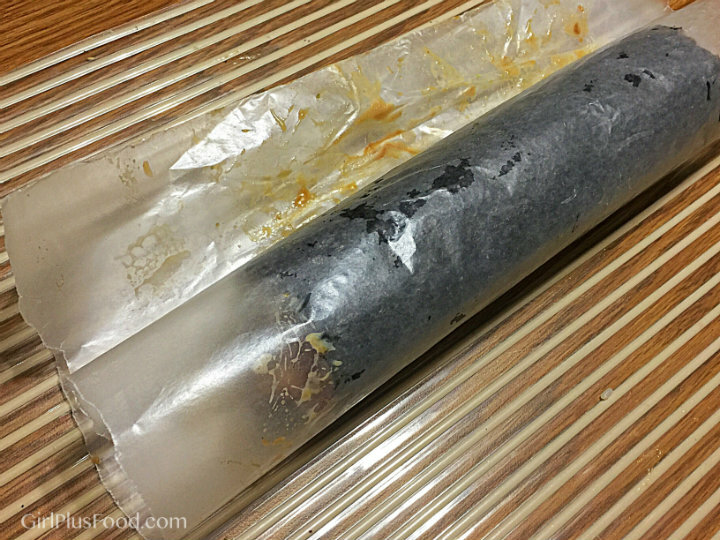 Place nori sheet onto a sushi rolling mat. If you don’t have one, you can use parchment paper like I did. Works just as well. Dip fingers in water and spread sushi rice on the nori sheet leaving a 1/2 inch space on the side closest to you and a 1 inch space on the side away from you. Add your fillings about one inch away from the bottom. Roll sheet, applying pressure as you roll. Once you’ve almost finished, add a little extra squeeze on the overlap between the two seaweed layers to ensure that the burrito stays together. The overlap should be about one inch. To make the burrito more presentable, cut the ends so they are even. I’m not that fancy, so I just sliced it in half and showed you the pretty ends. Previous: Cloud Bread – Low Carb, Just 3 Ingredients! Next: Easy French Onion Fondue! We also have sushi burrito shops near us but they’re so expensive! 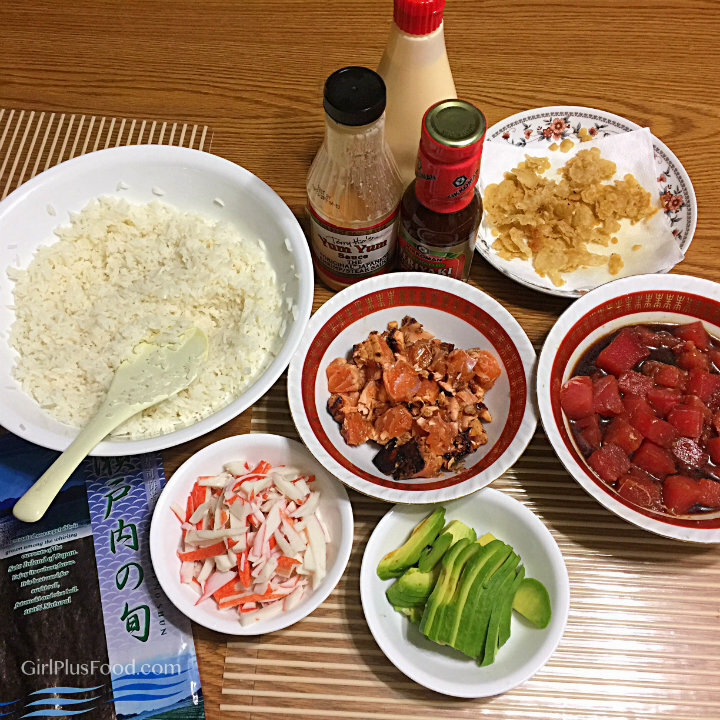 Thank you for sharing your recipe Carmen!